If you’re looking for some real hands-on history, try a game of Quoits during your visit to the Museum of Industry. 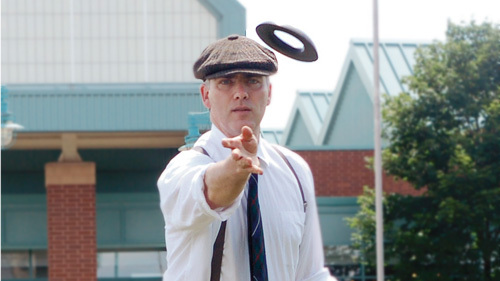 Brought to Nova Scotia in the 1700's by British immigrants, Quoits is a game of accuracy where players try to throw a steel or brass ring as close as possible to an iron pin. Quoits was introduced to Pictou County by immigrant coal miners, and was widely enjoyed in the industrial communities of the region. In the town of Westville, Quoits beds were built on the property of the Acadia Coal Company. Stellarton, Trenton, Hopewell and Pictou also fielded players and teams in the early 20th century. In this period an annual tournament was held, attracting teams from Halifax, Truro, the Pictou towns, Sydney Mines, Amherst, Moncton and Saint John, NB and Summerside, PEI. Usually held in Truro, the tournament was hosted by New Glasgow in 1921 and by Westville in 1933. Quoits enjoyed its heyday during the 1920's and 30's, but died out in the years following the Second World War. Related games still survive, however, and include the child’s “ring-toss” game of rope rings and wooden pins, and the popular back-yard games of Horseshoes and Washers. The Museum of Industry established our own Quoits beds in 2008, the centenary of the founding of the Maritime Quoits Association. Ask at the reception desk for equipment, game rules, and more information.